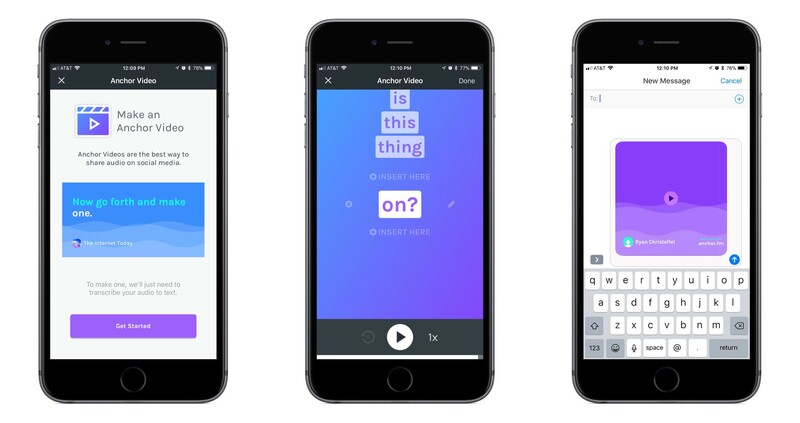 Anchor, the service that aims to bring audio creation to the masses, introduced a new feature today in its iOS app that offers a better way to share audio clips on social media: Anchor Video. Put simply, an Anchor Video takes your recorded audio, transcribes it, then creates a video out of the content. The finished product includes your original audio complemented by a running stream of the clip’s spoken words in written form; transcribed words animate across the screen as the clip plays, providing an elegant visual way of sharing your content on social media. If a follower comes across your video and doesn’t want to or can’t listen to audio in a given situation, they can simply watch the transcription fly by; and even if they do want only audio, presenting that audio as an Anchor Video will make it stand out more in a social media feed. The creation of an Anchor Video is smooth and easy. It starts with selecting a recorded clip on your Station and tapping the video button to the left of the share icon. Anchor will then work to transcribe the clip, which for longer clips may take a while, so there’s a feature to get notified when it’s done – a nice touch. After the transcription is complete, you can check to make sure it got everything correct and make any edits as necessary, including adding, removing, or editing words. When it all looks good, the video will generate – again, there’s the option to get notified when it’s finished if you don’t want to wait – and you can then share it in one of three formats: Square (1:1), Wide (16:9), and Stories (9:16). You don’t pick the format until after the video’s generated, so it’s easy after the fact to export in different formats for different services. Anchor Video is a well-polished solution to the problem of sharing audio across social media. It makes the task simple for users, takes into account how different services are optimized for different aspect ratios, and creates a finished product that looks good enough to share.